Sulfate attack can be 'external' or 'internal'. External: due to penetration of sulfates in solution, in groundwater for example, into the concrete from outside. Internal: due to a soluble source being incorporated into the concrete at the time of mixing, gypsum in the aggregate, for example. The effect of these changes is an overall loss of concrete strength. The above effects are typical of attack by solutions of sodium sulfate or potassium sulfate. Solutions containing magnesium sulfate are generally more aggressive, for the same concentration. This is because magnesium also takes part in the reactions, replacing calcium in the solid phases with the formation of brucite (magnesium hydroxide) and magnesium silicate hydrates. The displaced calcium precipitates mainly as gypsum. 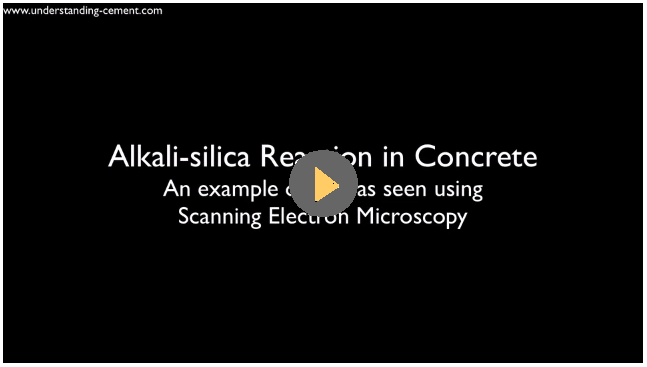 Figure 1 Scanning electron microscope image of sulfate attack in concrete. 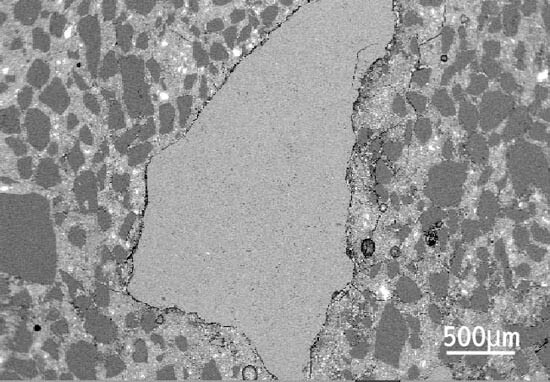 In Figure 1, ettringite (arrowed) has replaced some of the calcium silicate hydrate in the cement paste; the darker areas of paste have been partly decalcified. As a consequence of these alterations, the paste will be weakened. Although much of the cement paste here remains apparently unaltered (eg: top right), if widespread within the concrete (which in this instance it was) sulfate attack can significantly weaken the concrete. Occurs where a source of sulfate is incorporated into the concrete when mixed. Examples include the use of sulfate-rich aggregate, excess of added gypsum in the cement or contamination. Proper screening and testing procedures should generally avoid internal sulfate attack. Delayed ettringite formation (DEF) is a special case of internal sulfate attack. 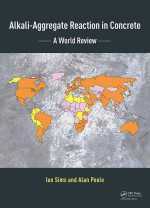 Delayed ettringite formation has been a significant problem in many countries. It occurs in concrete which has been cured at elevated temperatures, for example, where steam curing has been used. It was originally identified in steam-cured concrete railway sleepers (railroad ties). It can also occur in large concrete pours where the heat of hydration has resulted in high temperatures within the concrete. DEF causes expansion of the concrete due to ettringite formation within the paste and can cause serious damage to concrete structures. DEF is not usually due to excess sulfate in the cement, or from sources other than the cement in the concrete. Although excess sulfate in the cement would be likely to increase expansion due to DEF, it can occur at normal levels of cement sulfate. A key point in understanding DEF is that ettringite is destroyed by heating above about 70 degrees C.
DEF occurs if the ettringite which normally forms during hydration is decomposed, then subsequently re-forms in the hardened concrete. Damage to the concrete occurs when the ettringite crystals exert an expansive force within the concrete as they grow. In normal concrete, the total amount of ettringite which forms is evidently limited by the sulfate contributed by the cement initially. It follows that the quantity of ettringite which forms is relatively small. 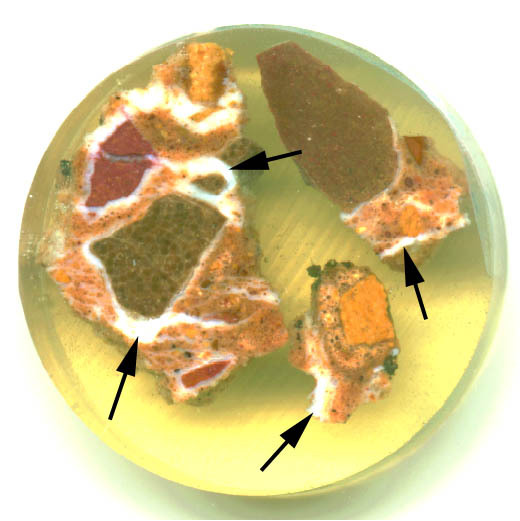 Ettringite crystals form widely-dispersed throughout the paste. If expansion causes cracking, ettringite may subsequently form in the cracks but this does not mean the ettringite in the cracks caused the cracks initially. DEF causes a characteristic form of damage to the concrete. While the paste expands, the aggregate does not. Cracks form around these non-expanding 'islands' within the paste - the bigger the aggregate, the bigger the gap. Figure 2 Diagram showing how paste expansion produces a small gap around small aggregate particles and a bigger gap around larger particles. 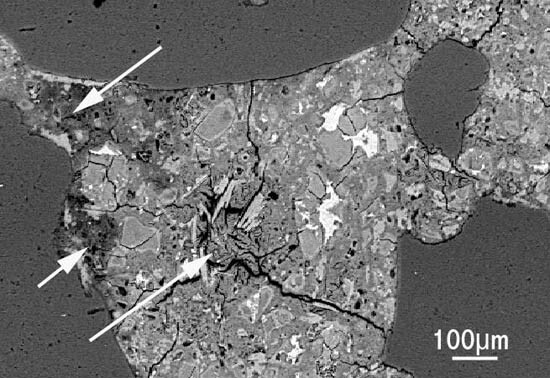 Figure 3 Delayed ettringite formation: scanning electron microscope image of limestone aggregate particle. Figure 3 shows characteristic of damage to concrete due to DEF. The cement paste has expanded and a gap has formed between between the aggregate and the cement paste. The aggregate is no longer contributing to concrete strength, since it is effectively detached from the cement paste. Often, these gaps become filled with ettringite. In laboratory tests, limestone coarse aggregate has been found to reduce expansion. DEF usually occurs in concrete which has either been steam cured, or which reached a high temperature during curing as a result of the exothermic reaction of cement hydration. As the curing temperature of concrete increases, ettringite normally persists up to about 70 C. Above this temperature it decomposes. In mature concrete, monosulfate is usually the main sulfate-containing hydrate phase and this persists up to about 100 C. DEF could occur in concrete which was heated externally, eg: from fire. An ettringite molecule contains 32 molecules of water; ettringite formation therefore requires wet conditions. DEF and ASR appear to be closely linked; in one study (Diamond and Ong, 1994) a mortar made using limestone aggregate was cured at 95 C. Subsequent ettringite formation within the paste was scarce and expansion was minimal. However, if aggregate susceptible to ASR was used instead of limestone, ettringite formation and expansion were both much greater. This, and other studies, suggests that ASR is, or can be, a precursor for DEF expansion. Lawrence C D 'Laboratory Studies of Concrete Expansion Arising from Delayed Ettringite Formation,' (1993) published by the British Cement Association. Lawrence C D (1995) Cement and concrete research, Vol 25, p903. Diamond and Ong (1994) in 'Cement Technology' (Ceramic Transactions Vol. 40, p79). American Ceramic Society. Kelham S, Cement and Concrete Composites, Vol. 18, p171. The thaumasite form of sulfate attack (often abbreviated to TSA) requires a source of sulfate and also of carbonate. Thaumasite can occur rarely as a natural mineral as an alteration product of limestones. Thaumasite can form in concrete and in mortar. The cement hydration products normally present, mainly calcium silicate hydrate and calcium hydroxide, are decomposed as a result of both sulfate attack and of carbonation. Since it is the calcium silicate hydrate in concrete that provides most of the strength, thaumasite formation results in severe weakening. It tends to form at low temperatures, typically about 4 C - 10 C. As it forms, the concrete or mortar converts to a friable material often described as a 'mush.' Concrete severely affected by thaumasite formation can easily be broken with the fingers and the coarse aggregate lifted out. A source of additional water is also required for thaumasite formation. Damp cementitious render over brickwork, especially where the render is cracked, and concrete and masonry in cool, damp cellars are typical examples of where thaumasite may occur. Normal sulfate attack usually results in the formation of ettringite. This uses aluminium provided by the cement and clearly this is limited in quantity in normal concrete. However, thaumasite formation does not involve aluminium; given an adequate supply of sulfate and carbonate, thaumasite can continue to form until the calcium silicate hydrate is completely decomposed. Consequently, while the use of sulfate-resisting Portland cement provides some defence against normal sulfate attack, it does not give any particular protection against thaumasite formation. Sulfate can be supplied from a range of sources; groundwater or bricks are common examples. Carbonate can be supplied from atmospheric CO2 or from limestone present in the concrete or mortar. Serious damage to concrete or masonry due to thaumasite formation is not a common occurrence, even in cool, damp climates. 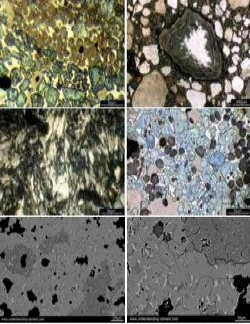 Figure 4 Thaumasite formation in concrete: polished section of degraded concrete from a highways structure in the United Kingdom. In Figure 4, thaumasite has formed around coarse limestone aggregate (large dark particles) and in cracks. Examples of thaumasite are arrowed. This polished section was 40mm in diameter but thaumasite formation is so extensive that it requires little magnification to be clearly visible. 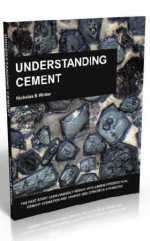 Check Out the Understanding Cement Resources! We have some great training and reference resources. Some are free and some are paid-for. 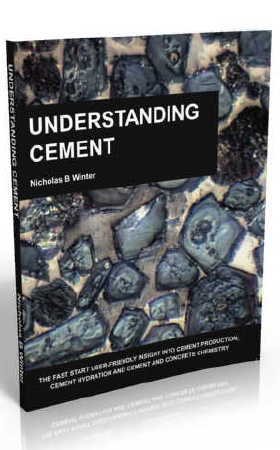 The paid-for resources are unique to Understanding Cement and proceeds from these sales contribute to the costs of operating and developing this website - see our bookstore here. 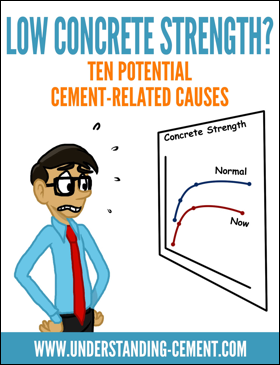 Ebook: "Low Concrete Strength? 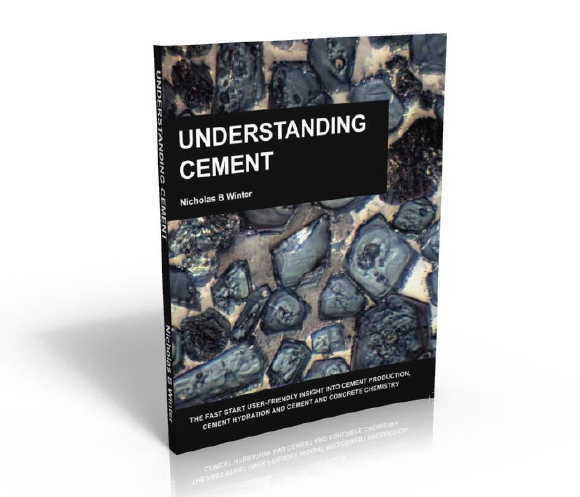 Ten Potential Cement-Related Causes": this illustrated ebook is a checklist of some of the main causes of cement-related low strength in concrete or mortar. 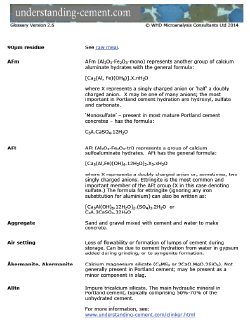 Cement glossary: glossary of over 100 cement-related definitions and chemical formulae. Screensaver/desktop images: six microscope images of clinker and concrete that you can use as desktop/tablet or screensaver images, or anything else you want. 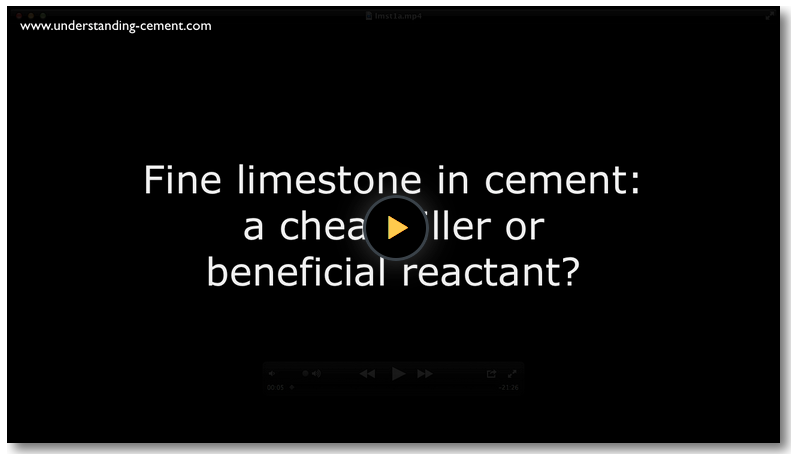 Subscribers to Cembytes, our free Understanding Cement Newsletter, can download these free resources from the Cembytes Resources Page. If you are not already a subscriber, just sign up using the box below and you can be downloading the ebook, glossary and photos within a minute or two. Make sure you bookmark the resources page so you can get back to it later - there are no links to it from the website navigation as it is for Cembytes subscribers only! If you are already a subscriber to Cembytes, you can access the Cembytes Resources Page directly if you have bookmarked it. However, if you have forgotten how to reach the Resources page, you can easily get back to it. Just enter your email in the signup box below and if you are on the subscriber list you will see a link to the Resources Page.